A caulking gun is a tool that holds either a tube or cartridge of caulk and disperses it at the proper rate and speed. Caulk is a product used to seal cracks and gaps in the home, around sinks, around tubs and other appliances. Caulk is particularly good at keeping water out. A caulking gun allows the tube of caulk to be squeezed evenly giving you more control to regulate the amount of caulk used and administer the caulk where it is needed. 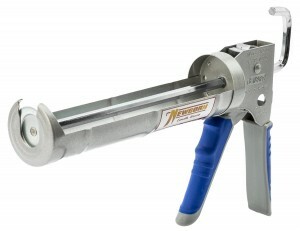 Without a quality caulking gun, it is difficult to control the exact amount that is extracted. This can leave your job a mess and looking unprofessional. You will also find that a lot of caulk is wasted and the cleanup becomes more difficult when a quality gun is not used. Caulking guns are relatively inexpensive tools. For most homeowners it is not necessary to buy a high-powered, high-end caulking gun. However, buying a low-end gun will generally result in poor quality work as they tend to release the caulk unevenly and it is difficult to control the flow and the drip. A caulking gun is great to have in your tool collection and will allow you to apply caulk with ease giving you professional-looking results. These guns can be used for sealing windows, nail holes, even sealing basements and repairing damaged walls. Caulking guns have a wide variety of uses and provide a clean and professional finish time and time again. After evaluating 26 of the top brands and models in search of the best caulking gun, the Newborn 930-GTD caulking gun rose to the top as our best all-around caulking gun. It accepts a standard-size cartridge and has a no-drip feature making it both easy to use with a simple cleanup. Anyone who owns a home should own a top quality caulking gun. Over time, windows need to be resealed and sinks and tubs need to be re-caulked. Doing these projects yourself does not require a high level of skill. 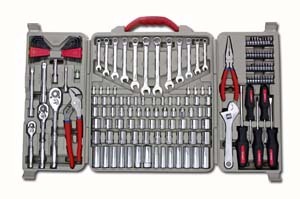 This tool is for almost everyone who does basic home repairs and maintenance. If you hang pictures, have windows that leak air, or perhaps the doors have acquired cracks over time. A caulking gun is perfect for any of these situations making it a very versatile product. Caulking guns are also a must-have for wood working, handy men and other home improvement professionals. Caulk can be made from a variety of components such as latex or silicone and can bond to a wide variety of substances such as metal, ceramic, wood, glass and many others. Before using your caulking gun, you must first clean the surface of the area you want to seal. This includes removing old caulk, dirt, and loose particles. You can do this by using a caulk-removal tool, or a wire brush designed for concrete and masonry applications. Once the old caulk has been removed, wipe down smooth surfaces with a wet cloth or sponge and then dry the area before beginning any new applications. It is also a good idea to tape the area around the crack or hole you intend to fill to create a smooth edge. Caulking guns are easy to use and can provide professional results by both beginners and experiences home improvement DIYers. To use your caulking gun, simply press the release at the back of the device, releasing the plunger. Next, pull the plunger back as far as it will go and insert your tube of caulk into the gun with the nozzle facing the front of the caulking gun. Next you push the plunger into the back of the tube making sure the caulking gun is now loaded and working properly. Next you cut the tip of the nozzle of your caulking tube to match the size of the bead you want to apply. This hole size will determine how much caulk is released when you squeeze the trigger. Holding the gun at approximately a 45 degree angle you are now ready to administer the caulk into the space. After application, it is best to smooth out the newly-applied caulk with your finger or a flattening tool. 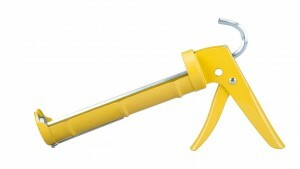 The first thing to consider when choosing a caulking gun is the material used to make it. 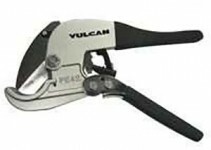 The best caulking guns are constructed from a durable material such as steel or other strong metal. Strong construction will provide you with a long-lasting caulking gun, prevent rust, and offer a much more powerful rod for applying the caulk. Next, check the size of the cartridge or tube that will fit in the gauge. If you plan on using your tool only for small projects, it will be less important if your gun will be able to fit larger cartridges. On the flip side, if you intend to use your caulking gun for larger projects such as sealing windows, doors, or other large spaces, you will want a caulking gun with a larger capacity for caulk such as 1/10 gallon cartridge. Ratchet control will stop the caulk from dripping after the trigger is released. This is a very convenient feature not found in lower grade models but can make a big difference in both application and clean up. Thrust ratio is also an important consideration. This will enable you to apply larger or smaller amounts in a certain period of time based on your needs. For example, if you are repairing a nail hole you will only require a small amount of caulk at a time. On the other hand, repairing a large crack in your door frame may require a larger and thicker amount of caulk to be administered. When searching for the best caulking gun on the market we carried out extensive research that began with a general search of all caulking guns available on the market. Next we determine what features make a good caulking gun and narrowed our selection to those that had the criteria needed to make a quality gun. After this we tested the final models and spoke with professionals and homeowners who had direct experience using caulking guns. We then referred to expert advice, tool blogs, magazines, best-seller lists, and customer reviews for our final evaluation. The Newborn 930-GTD is the best of its kind and ranked high above the rest in all-around performance, durability, efficiency, customer ratings, and overall quality. 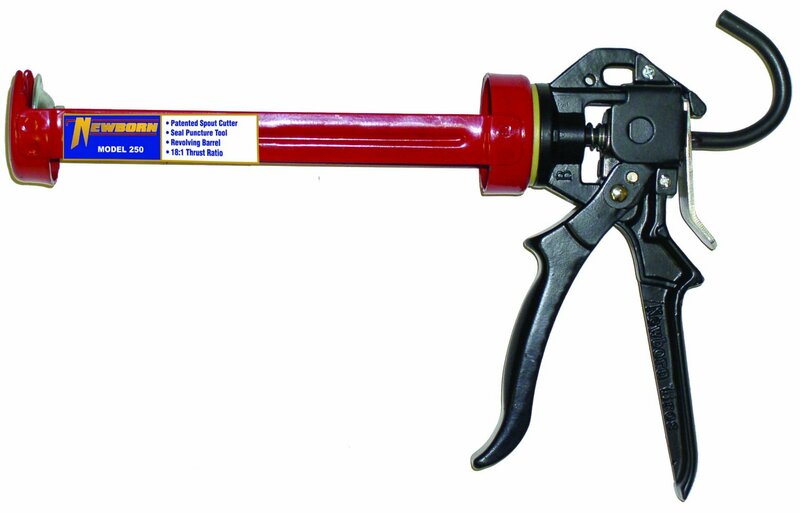 This caulking gun is made of all steel welded construction with a steel half barrel. It has a 1/10 gallon cartridge capacity and a thrust ratio of 10:1 this means that this particular caulking gun is cut out for projects both big and small and can fill even the biggest holes and cracks with ease. Its smooth pressure rod needs less force to retrieve caulk from the tube and is quieter than the traditional ratchet style caulking guns. The pressure rod also has the added feature of retracting after each pull of the trigger to prevent dripping or excess caulk from escaping. The handle and trigger are both padded with a thermoplastic grip for comfort so your hands and fingers never actually have to rest on the texture of the steel. The Newborn 930-GTD is extremely durable and is built to last a lifetime with all the features necessary to conduct the best work possible and provide a clean finish. The next step up is the Newborn 250 caulking gun. 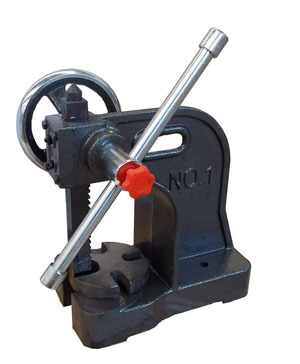 This gun is made of all steel and contains a high thrust rate of 18:1 for use with acrylic, adhesives, asphalt, butyl, and cement. 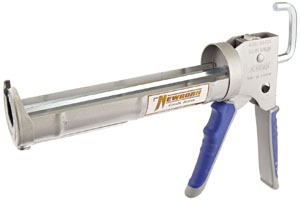 The newborn 250 caulking gun also has a rod revolving frame. With a 1/10 gallon cartridge and a smooth pressure rod that requires less force and is quieter than traditional ratchet style pressure rods. This gun also features a zinc alloy handle and trigger for corrosion resistance and includes a ladder hook for precision caulking. Wear protective gloves to keep caulk off of skin and off of clothing. Protective goggles will help prevent caulk from getting in your eyes. Keep hands away from moving parts to avoid getting pinched or having your clothing caught in the chamber. Keep a safe distance from others when using your caulking gun. Always read the owner’smanual before using the product. Store the caulking tube properly. After using your caulking gun remove the tube and store in a cool dry place, ensure that all gaps on the tube are closed to prevent the caulk from drying out. Remove excess caulk after every job, any caulk that may be left over on your gun could dry and harden preventing your gun from working correctly on your next project. Regularly inspect your caulking gun for damage. look for cracks or broken parts before you begin using your tool to ensure your safety and the use of your tool. Lubricate the chamber and trigger to keep it fluid. Store in a dry place to prevent the metal from rusting. Caulking guns are versatile tools used for filling cracks, gaps, holes and other spaces. 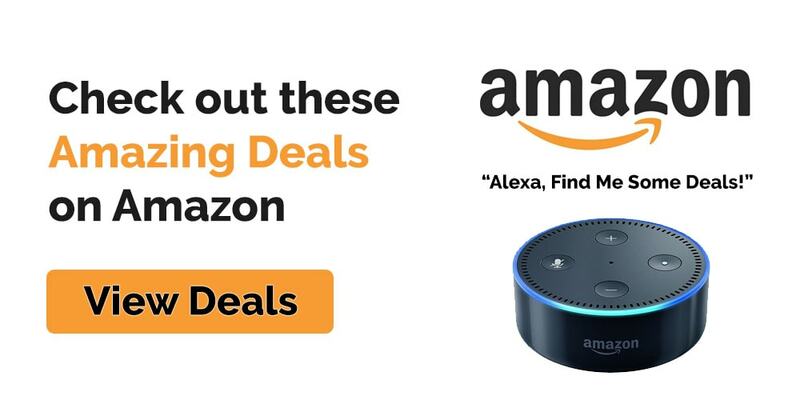 These tools are easy to use and require no experience to operate effectively. Caulking guns are inexpensive and provide an easy way to re-caulk tubs or showers along with preventing air from leaking on older windows and doors. Investing in a top quality gun can still be accomplished inexpensively, making it an investment that will save you both time and money.